I was at least a year in London before someone pointed out the divers to me, the gold statues on a rooftop near Picadilly, on Jermyn Street. I’d never have noticed Antony Gormley’s naked man in Oxford had a crowd of tourists not been gazing skywards. And in Bristol a couple of weeks ago, in search of Banksy’s graffiti, I’d passed by one without even noticing so fixed was I on the road ahead. I’ve never been a great one for planning ahead. The plan has always been to have no plan. It’s served me well so far and has even worked in my favour. Not limited by ambition or goals; not focused on specific, sought-after outcomes; not defined by where I want to be in five years time because I’m still figuring out where I am right now, I’ve had the freedom to react to opportunities that present themselves, unannounced. Admittedly, it’s not for everyone. And perhaps, were I to examine it a little closer, I’d find a subconscious plan of sorts. And perhaps you could argue that not having a plan is a plan in and of itself. Whatever. 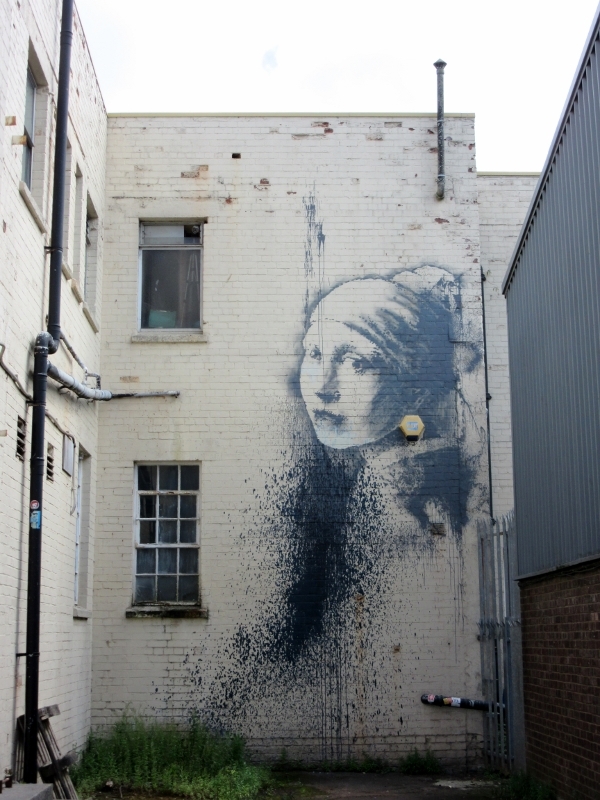 We had a plan in Bristol – we were going to see the city using Banksy as our guide. Born in Bristol in 1974, Banksy’s road to fame and fortune began with a can of spray paint. Today, he’s known the world over and his art has appeared on walls everywhere. There’s even a Banksy shop in Bethlehem. What I hadn’t realised though is that he’s done much more than paint. His Paint Pot Angel is on display in the Bristol Museum. The title says it all. This is Banksy’s challenge to what we expect to see in museums and what value we put in art. Apparently back in 2009, he took on the Bristol Museum in an exhibition that was organised in secret and when it opened, people queued for as many as 5 hours. Over 350 000 people came in a month and the event was rated one of the top 3 tourists events in the world that year. 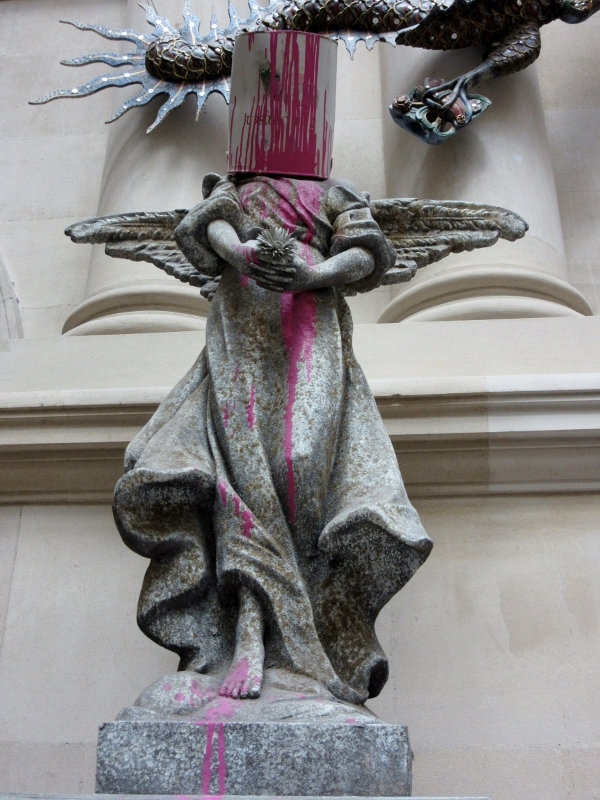 Bristol Council insisted on paying Banksy for the exhibition – he finally accepted £1 and donated the angel to the museum when it was all over. I was quite taken with it – mainly because it was so not what I’d expect from the man. I had thought he had limited himself to stenciled art. How wrong I was. Just goes to show, eh. And I didn’t know that his documentary Exit Through the Gift Shop, billed as ‘the world’s first street art disaster movie‘, debuted at the Sundance Film Festival in 2010 and was nominated for an Academy Award in 2011. Where was I was all that was happening? On the side of a sexual health clinic on Frogmore Street, he did this little number, captioned ‘Well hung lover’. Interesting that the lover is starkers and the gal still has clothes on. Not quite the usual depiction and I’m left wondering what was going through his head when he thought this one up. And are the splotches of blue paint part of the deal or were they blaubed afterwards? Apparently for this one, he posed as a painter behind closed-off scaffolding, with permission from the then owners of the building, the band Massive Attack. But no, and no. No arrest. No revealed identity. His parody of the famous Vermeer painting sees the pearl earring replaced with an alarm box. It’s down on the docks, on the waterfront, tucked away between two buildings. And yet once you know it’s there, you wonder how you could have missed it. Banksy borrowed a friends boat and left some graffiti on the side of the Thekla depicting the letters of his name, ‘Banksy’. When the Harbourmaster saw the graffiti he came along and painted it over in black. This made the owner of the boat very angry -as he was a Banksy fan- and threatened the Harbourmaster with legal action for criminal damage. 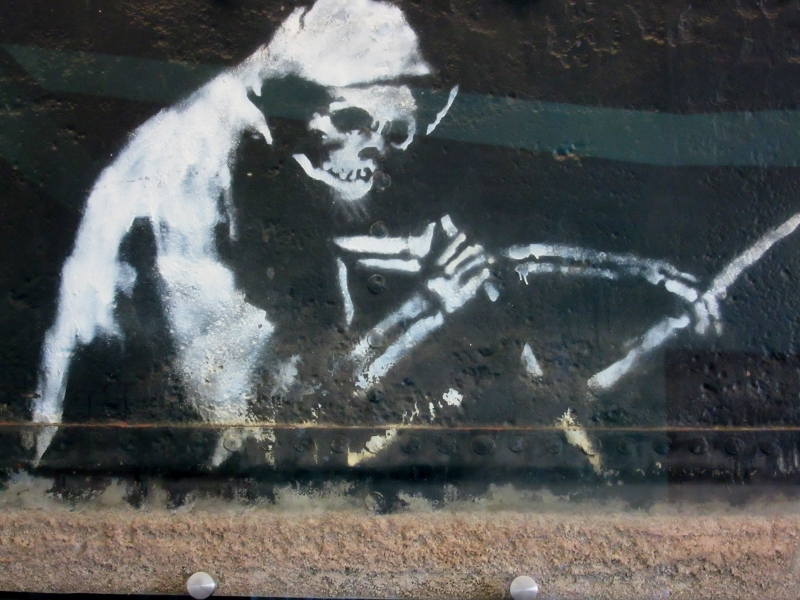 Hearing about the dispute and never one to hide from mischief, Banksy borrowed his friends boat again, leaving a stencil of the Grim Reaper in a boat and wondering of the Harbourmaster would act again. And there are more – plenty more. We ran out of time. But as I’ve said before, Bristol has earned itself a place on my ‘have to revisit’ list. It’s a cracking city – with no shortage of things to do and sights to see. And it’s reminded me of the value of looking up. Oftentimes we’re just a tad too focused on what lies ahead to see what’s going on right beside us. And oftentimes, too, the wonders of the world are right there on our doorstep. All we need is a slight change of perspective.